Today I wanted to tell you about shopping for BYOP SIM Kits. I don’t go out shopping too often but when I do I try to swing by a store’s electronic’s department to check out the prepaid wireless section. So I thought I share with you some photos I took on some recent visits to Best Buy, Target, and KMart. First let’s take a look at Kmart. I noticed they have Total Wireless phones, plans, and even BYOP SIM Kits. These SIM kits cost $1 and don’t include a plan with them. They also have different plans cards. Check out the 3GB of data for $10. The also have an older Tracfone BYOP SIM Kit. This is $30. It includes a $20 of service so your paying $10 for the SIM. Next is the newer kit. This only cost $1, but no service plan is included. Next up, let’s check out Target. 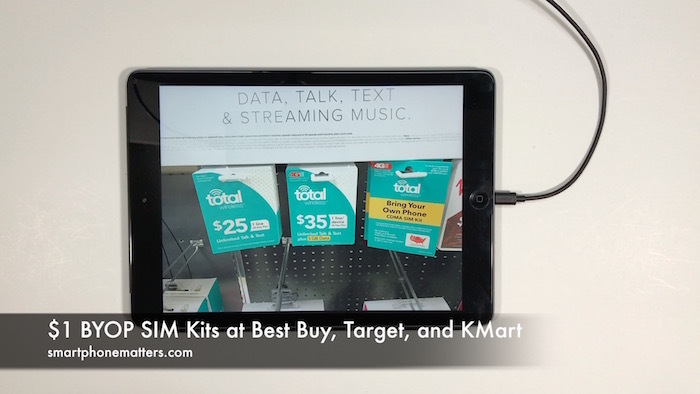 We can see Net10, Total Wireless SIM kits for a $1. Alos a Verizon Kit for $50 with $45 service credit so the SIM is costing you $5. Also you can see an H20 wireless kit for $35 with $30 of credit. Finally lets look at Best Buy. You’ll see $1 SIM kits from Tracfone, Net10, and Simple Mobile. There is a $10 H20 SIM only kit. You can some unlocked no contract phones there. Best Buy also has a display in the store with unlocked no contract phones. I did not get a photo of that though. While I didn’t see this in the store, I noticed online that you can buy unlocked Samsung Galaxy S devices in from Best Buy. Bring Your Own Phone (BYOP): SIMS starting at $0.99! Bring Your Own Phone with a $1 SIM card! BYOP: Monthly Plans Starting at $9.99 at TotalWireless.com! Even though I read what you wrote, I still don’t understand exactly what the $1 sim kit is for. Say for example I just bought the $1 sim kit itself, what does that do? Would it activate my phone? Bc if so, that would be great for me since I mainly use wifi but still want to be able to receive software updates. Ty for your time! Your phone needs the SIM kit to operate on a wireless carrier’s network. Without the SIM the phone won’t be recognized by the wireless carrier. Once you have the SIM, you need to pqy for a plan and activate it. Once activated, you could even move the SIM to a different phone and your number and service moves with it.